How Is Rough-In Plumbing Constructed? The initial rough in for the plumbing begins once the foundation is back-filled. Trenches for the water and sewer lines are dug in the soil and the pipes are laid in place in their rough position. Once the pipes are in place, gravel is poured in the form as a base for water to drain away. The gravel is covered with thick plastic as a vapor barrier and the foundation is now ready for concrete. Rough-in plumbing is the process of installing vent, sewer connections as well as water lines for your home. This is one of the first necessary steps in constructing your home. Once the back filling process for your home base has been finished, you should immediately commence the installation of your pipe line and sewer system. This is not an easy task so it would be best to hire an expert plumber to do the job for you. The period for completing the entire rough-in plumbing procedure usually takes two to four days depending on the complexity of your plumbing needs. 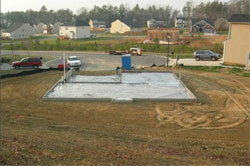 Rough-in plumbing goes beneath the concrete structure or slab where there are wires attached thereto. It is advised that you place the wirings in a protective pipe or tube together with the rough-in system so as to have an organized and orderly plumbing system. However, there are times when the building contractor may place the wirings inside the walls or ceiling and if this is the case; there is no need to place the wires in a conduit. The rough-in plumbing system should first be enforced and completed before the soil treatment group begins their job. This will ensure that there will no longer be a need for further excavation through the plumbing lines. This is where proper planning comes in. A good building contractor knows all about the proper procedures as well as the building codes which must be followed at all times. Many homeowners build their houses with a plan to expand in the future and if this is what you have in mind, it is a must that you tell your building contractor to build a rough-in plumbing system which can cater to future expansions. Additional work may have to be done, such as: setting up additional pipes and vents for that purpose. 1. A rough-in plumbing diagram should be drawn first before you start constructing your underground plumbing system. The said diagram includes all the pipes and lines which must be connected as well as the materials to be used during the process. You should always stick to the plan if you want your water and drainage lines to flow properly. Various materials are used for building your toilet, drop-in or counter sink, pedestal sink, bath tub and shower. 2. The water lines for your bath tubs have to be done earlier than the rest of the pipes because the bath tub units are usually bigger and cannot be easily moved during the course of the rough-in plumbing process. In addition to this, there are times when the size which was indicated on the plan is different from the one delivered. This is the reason why your rough-in plumbing should be flexible and fit for any type of finishing materials to be used later. 3. The underground pipes and lines are connected and joined together for easier attachment to the septic tank. The best water system should go around the house for convenient water access. Rough-in plumbing is a tedious task and the plumber should be very careful in performing his job. There are certain plumbing standards which must be strictly followed to avoid leaks and drainage problems. 4. The best slope for your drainage system should measure one-fourth inch per foot. This is the standard measurement which must be followed. Take note that if the slopes are too little, it will not be easy to drain liquid as well as solid wastes. On the other hand, if such slant is too much, the water will go down the pipe in a much faster pace which is not also good because there is a tendency for solid wastes to be left behind. If this happens, you can expect pipe clogging in the future. These are the general guidelines on how rough-in plumbing is constructed. If you follow this guide you should have no problems completing a successful rough-in plumbing job.